FINALLY HITTING PUBLISH ON THIS POST!!!! 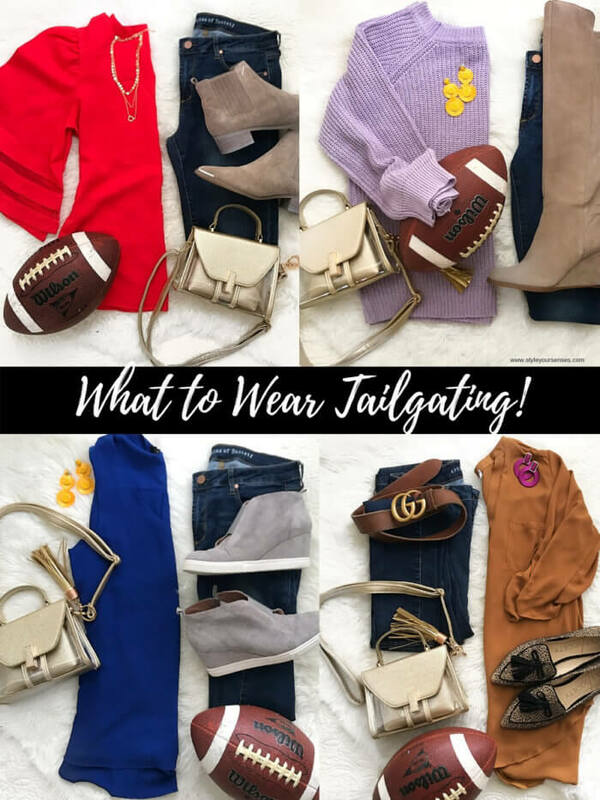 This “What To Wear Tailgating” post has been one of the most requested posts for years now and I have finally compiled everything that I wanted to include and am getting it out to you guys! A few weeks ago I asked for some feedback on college tailgating, dressing for it and which schools you rooted for and I was literally blown away with the response! We counted over 2,000 responses and (what felt like) nearly every college on the map represented…woah!!! Safe to say that you guys love college football as much as I do and you also like to dress the part! Like I’ve mentioned before, I went to LSU (Louisiana State University) where the football traditions are rich and tailgating is a sport in and of itself. 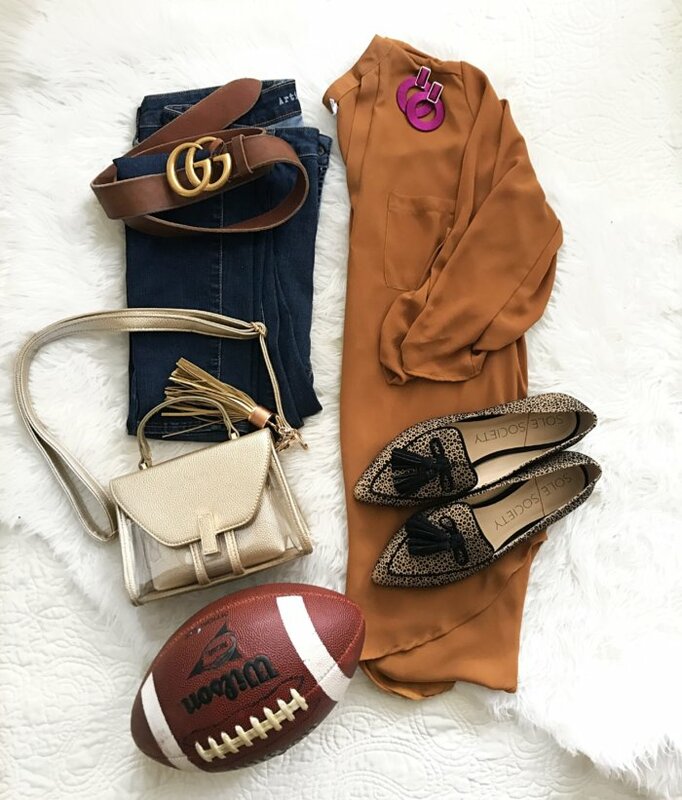 In college, choosing our game day outfit was SO much fun and we loved getting dressed up in our school colors for a fun day of football. What I love most is that not much has changed, I still LOVE getting dressed up for game day and am counting down the days until I’m in Death Valley again cheering on my Tigers (I’ll be there in 10 days, and I’m SO ready)! 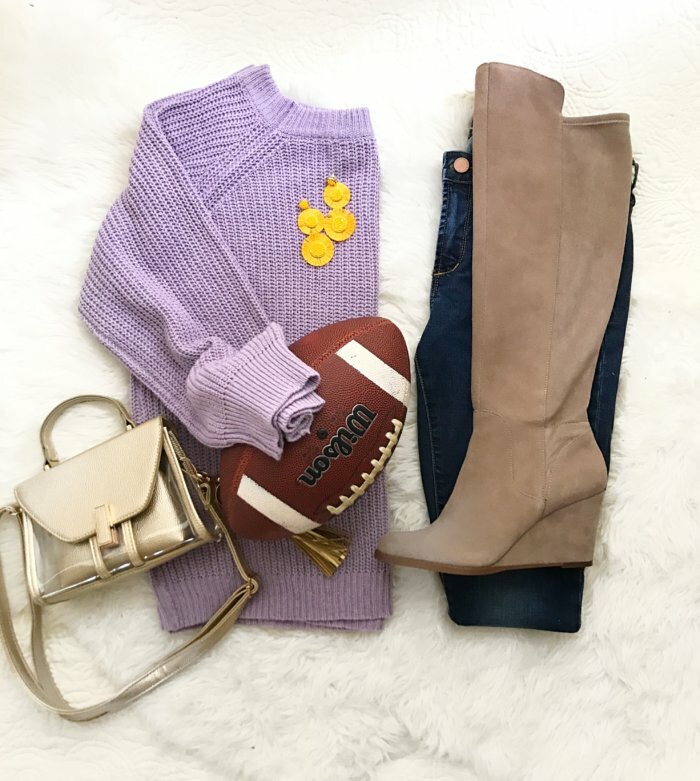 I wanted this post to be a comprehensive guide full of inspirational looks for you to re-create and wear to cheer on your team. I broke down the top responses and took the dominant colors, which are all represented in this post. 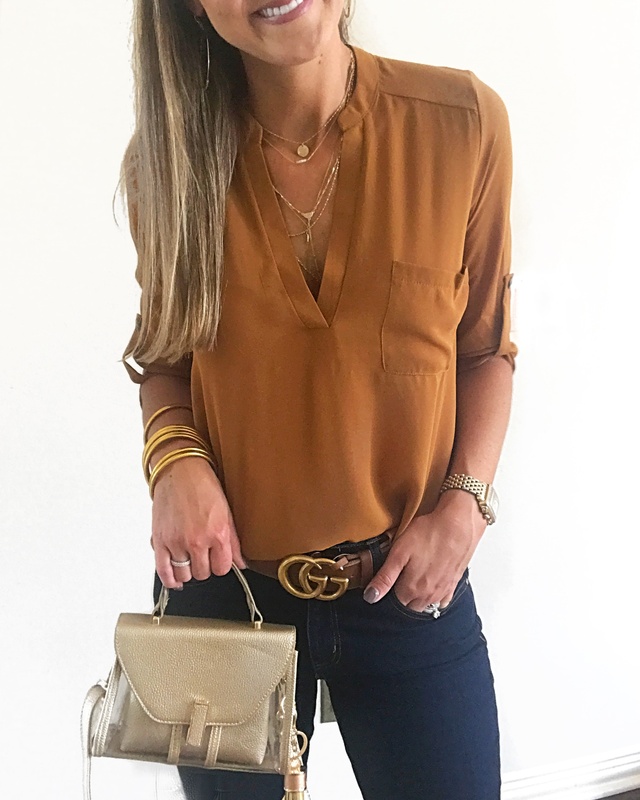 I also tried to choose pieces that came in LOTS of colors, so that not matter what color you’re looking for there’s bound to be something in this post that will work! First up is this inexpensive sweater! 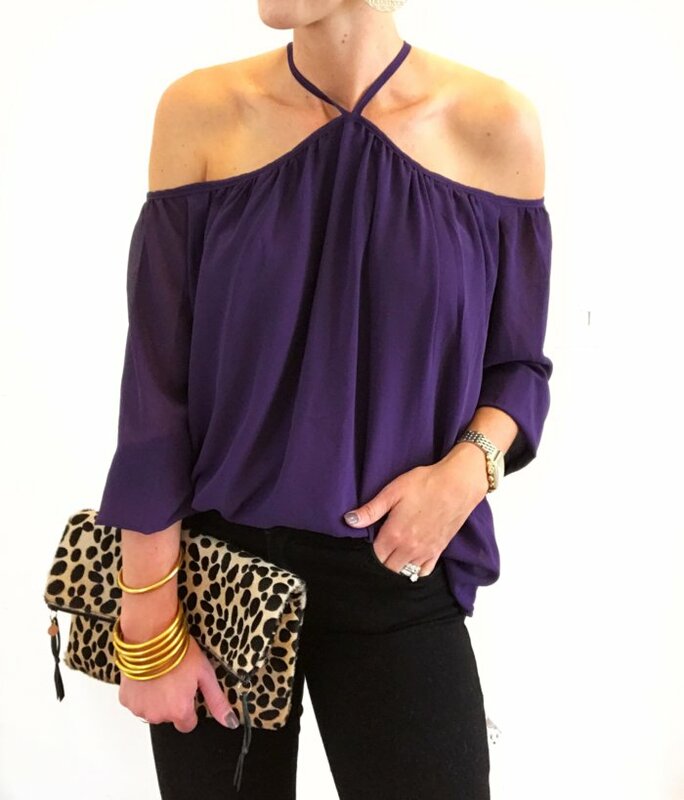 It hangs slightly off of the shoulder and is great for all of my LSU girls (other colors available too)! I paired it with these wedge boots because I LOVE the look and these boots are comfy enough to wear all day! Y’all might remember THIS TOP from last months Amazon post. I actually think that it’s what I’m going to wear for next week’s LSU game! 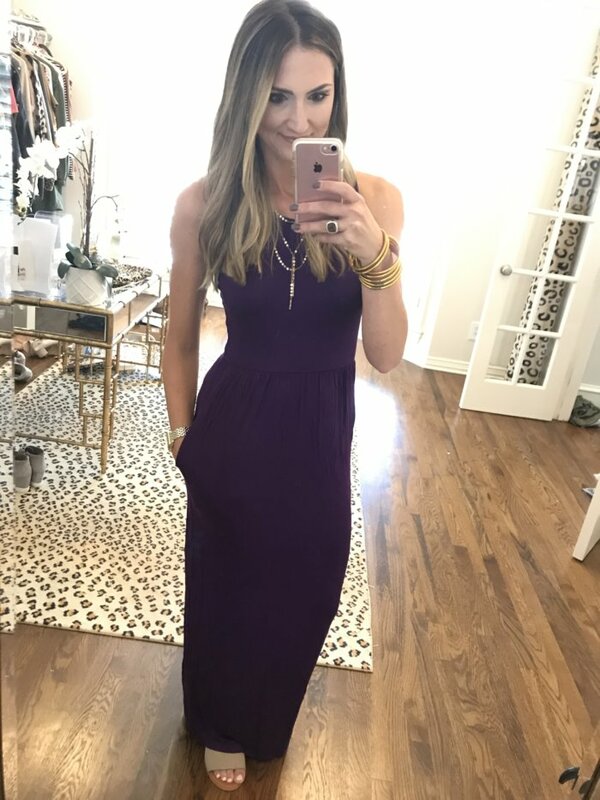 It’s SO flattering and easy to wear…not to mention the under $20 price! It comes in quite a few other great school colors (red, blue, etc), so make sure that you check for yours. Worlds most flattering maxi dress! 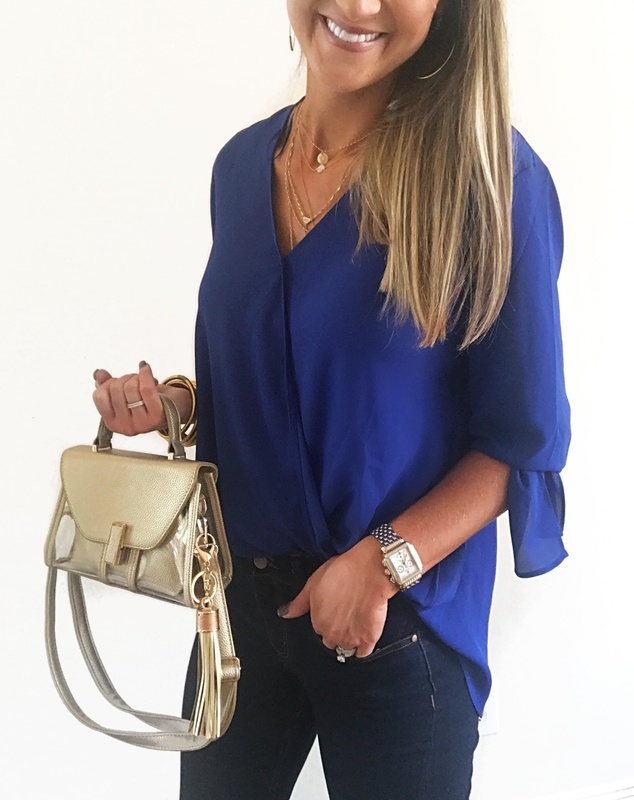 Great price, pockets and can easily be layered over…such a winner! I cannot get over this $20 top! It’s a knock off of a much more expensive one and it looks amazing on! I kept it for myself because I loved the fit so much. The flared sleeves with the mesh details are awesome. Trust me on this one! 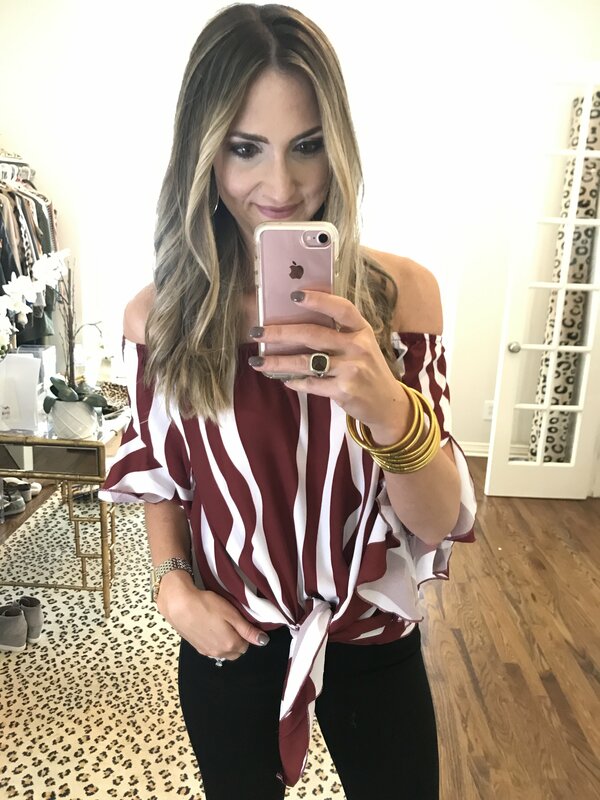 Y’all know that I love this top and have it in two other colors already! I think that the red is so much fun for a game day and you can easily layer over it as well. 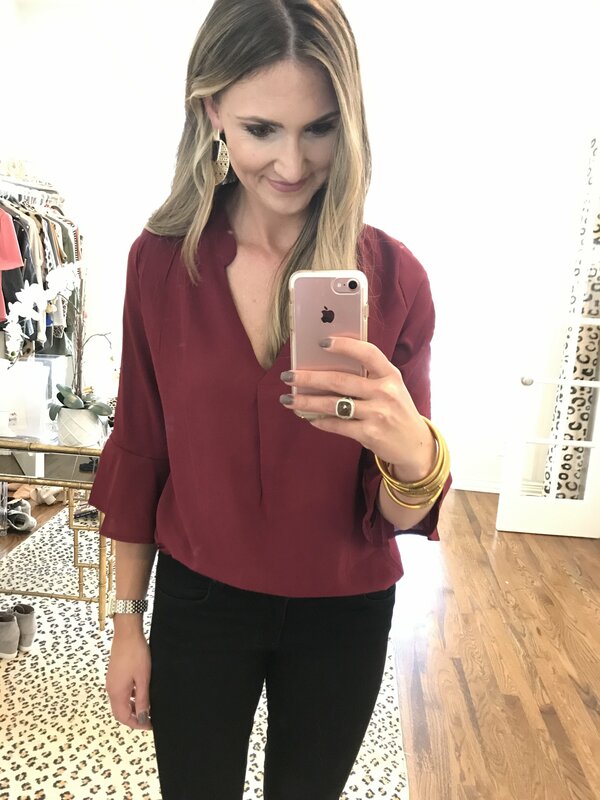 This tunic is in my closet in 3 other colors, so I immediately bought this gorgeous Fall color as soon as it came out! Great for tailgating either with leggings and booties or front tucked into your favorite pair of jeans. Best part is that it’s only $27 and comes in a ton of other colors. Lots of blue! This tank was my favorite. 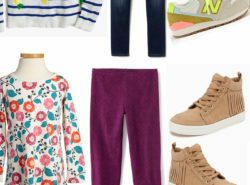 It’s simple but it’s just a super flattering fit (see right, below). Easy to throw something over later in the season, too. It also comes in a TON of colors, so I’m sure that you could find something to work for your school. Both of these tops were favorites from last month’s Amazon post and both are tops that I HIGHLY recommend (for game day or otherwise)! Both under $20, come in tons of colors and are flattering, fuss free fits. 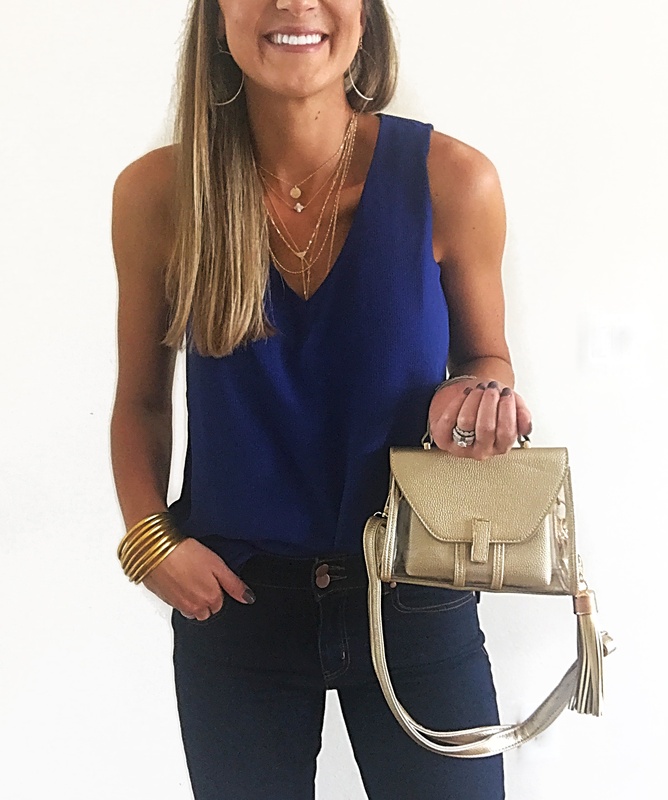 You cannot forget your accessories on game day and I love that all of these pieces come in TONS of other colors, click through to see if your color is available. 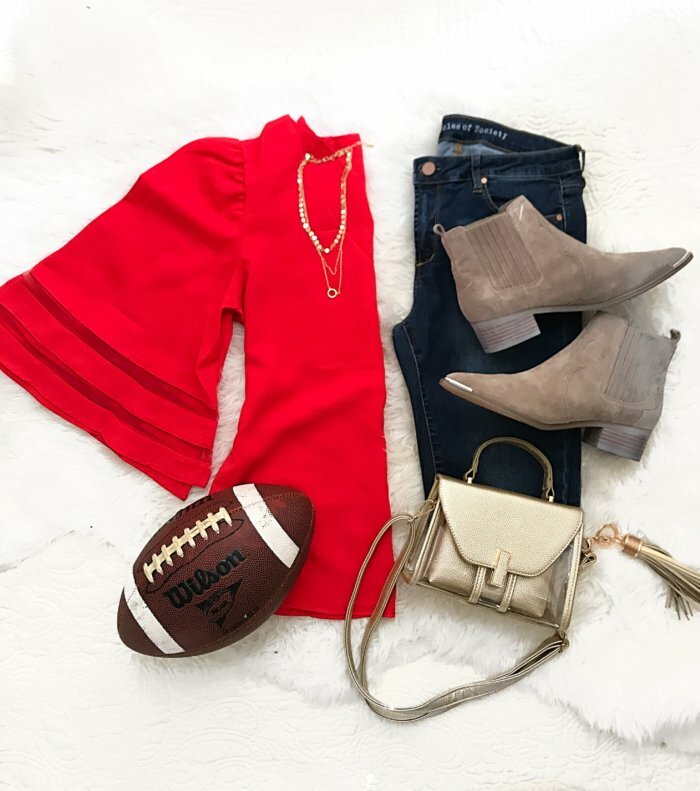 Comfort is KEY on game day, but you can still look cute! 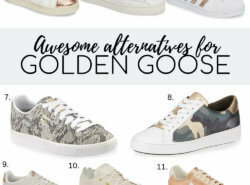 Here are some of my favorite comfy shoe options that are still super stylish. As it cools, here are some great neutral game day layers! I truly hope that you liked this post! 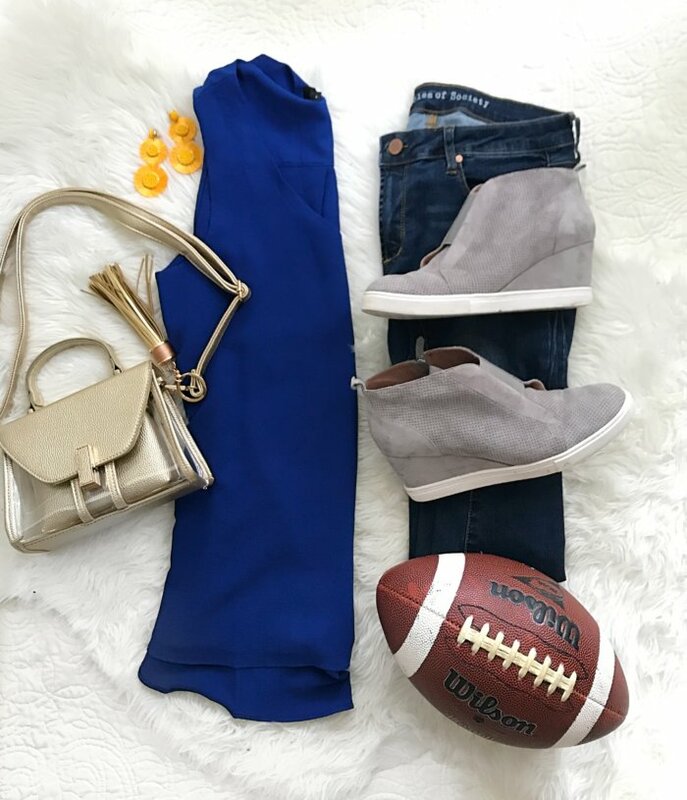 I tried to include all of the game day essentials to keep you looking on trend, while staying comfy! It would mean the world to me if you shared this post with your friends who might also find it helpful!! Thank you for being here and don’t forget to leave any feedback or questions in the comments!